There are a plethora of healthy chip recipes out on the internet. I have tried probably about half of them and usually end up with a soggy pile of potatoes that no one could even generously call potato chips. 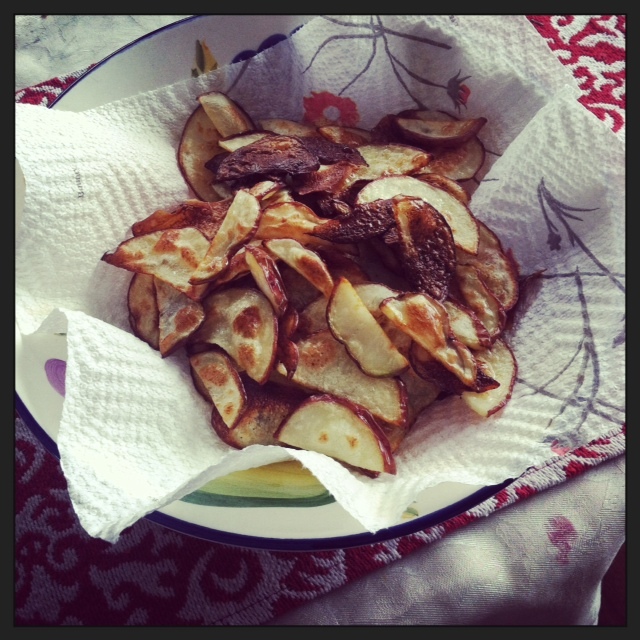 I set out to try and figure out what the secret trick was to make crispy and yummy chips. I think that I got pretty close, not exactly like a bag of Lays, but pretty close. I will say that you might want a few special tools to make sure you get as close to a store bought potato chip as possible. These two tools are a Silpat and a mandoline. The Silpat really helps so that your potato slices don’t stick to the pan while you are cooking them, but if you don’t have one parchment paper can work as well. The mandoline helps to slice the potato very thin, which is uber important to a crispy chip. If you don’t have a mandoline, you can use a regular knife. Just make sure to cut the potatoes as thin as possible. Alright enough talking, let’s make some chips! 1. Bring your pot of water to a boil. Wash and dry your potatoes. With either a mandoline or a knife, slice the potatoes into thin rounds. 2. Bring your bowl of cold water over to the boiling water and place your potatoes into the boiling water. Cook for 2-5 minutes and then immediately put them into the cold water. Drain the potatoes and pat dry as best as possible. 3. Preheat oven to 450 and line a large baking sheet with either a Silpat or parchment paper. Lay your potato rounds in a single layer on the baking sheet, making sure they aren’t touching or overlapping. You may have to make them in batches. 4. Lightly brush or spray the potatoes with olive oil (you don’t need a ton), and then sprinkle with sea salt and any other seasonings you want. 5. Bake in the oven for 15 minutes. Remove and flip over the slices and bake for another 5 to 10 minutes. Keep checking to make sure your chips don’t burn. Remove from the oven and let them cool on a wire rack. This also helps them to crisp up a little as the cool. You can experiment with seasonings as well as cook time to make the perfectly crispy chip. This is just what worked best for me and my oven. Now go enjoy your tasty snack!